Home » Florida Fun » Happy Independence Day 2012! Happy Independence Day! Hope you’re enjoying the spirit of America today. To celebrate the holiday I headed down to Southwest Florida’s Charlotte Harbor to wish participants of the 21st Annual Charlotte Harbor Freedom Swim across the Peace River well. The swim started 21 years ago when a few friends decided to celebrate Independence Day by swimming across the Peace River. Today, hundreds of people participate in what’s been described as a gloriously unorganized blobblefest either with foam noodles; neon inflatable rafts; red, white and blue attire or just swim trunks. Others choose to do it by some kind of boat. 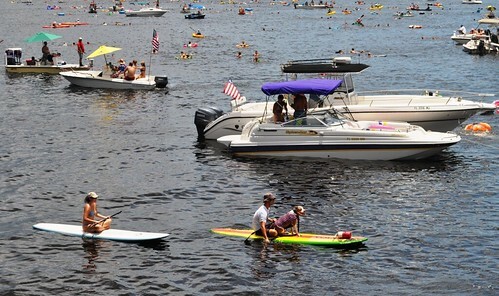 Some participants were the four-legged furry kind, either swimming or sitting atop a paddleboard. 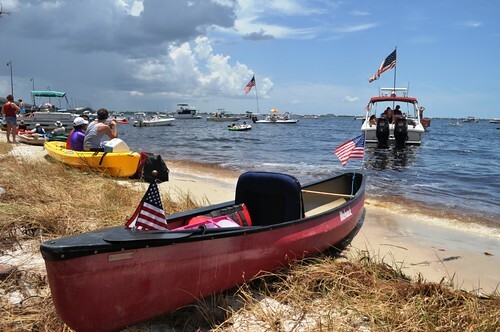 Without a doubt, the Charlotte Harbor Freedom Swim is one of the most fun events in Punta Gorda. The swim beings in Charlotte Harbor under the Gilchrist Southbound Bridge (U.S. 41) and ends at Fishermen’s Village in Punta Gorda, just over 1.5 miles away. I’ve participated in the Freedom Swim before, both as a swimmer (2008) and kayaker (2011) but this year I was just an observer. Freedom Swim co-founder Michael P. Haymans kicked off the swim by yelling out safety instructions prior to the 2 p.m. start. It sounded as though it’d be a tough swim but participants looked up for the challenge. New this year was a Coast Guard sign up form in which about 200 people signed. I guess this is to account for everyone and not leave anyone out there. By the way, Michael’s one of the kindest and neatest people you’ll meet.